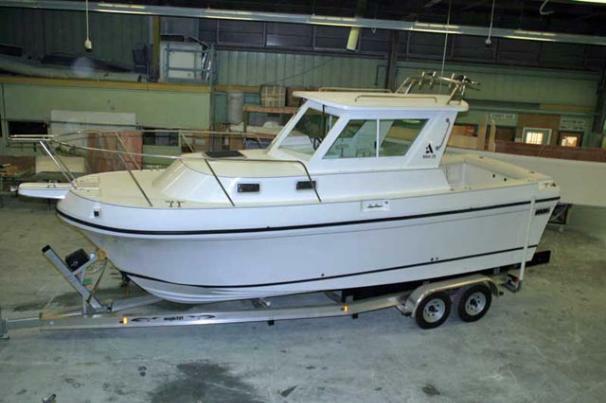 Boat Description The 26 Tournament Express may be the least expensive Albin, but there is smart design and value evident regardless of where you look. In the cabin, there is a full 66 of headroom. Those six footers plus will also be comfortable in the settee that converts to standard V-berths or a large double. There also two fold up bunks enable the 26 TE to comfortably sleep four. An enclosed, large head and ample shower are well integrated, as are large counter area and galley gear. Thanks to its efficient design, the 26 TE delivers the interior room of a larger boat in a very efficient package. The cockpit area is large. The deck back to the transom is flush, The wells are seats when the tops are down. They are located and a hinged board flips up to form a comfortable bench seat. The helm delivers excellent visibility and an ergonomically designed command center that will be welcomed by experienced captains and novice weekenders alike. When it comes to performance the 26 Tournament Express powered by the standard Volvo D3 diesel I/ O with a duo prop and composite drive powerplant really moves, is economical and enviromentally friendly. The 26 Tournament Expresss beam of 8 6 in a 6,300lbs package that is completely trailerable by any capable SUV or truck. Engine Notes Yanmar diesel also available.